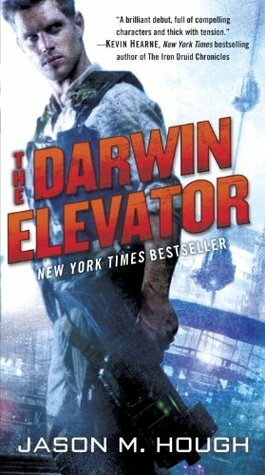 “The Darwin Elevator” is an entertaining, action-filled read that I enjoyed enough for me to want to find the follow-up volumes to see how the story continues. It has some good qualities going for it, including tight writing and memorable characters given enough complexity to draw them beyond indistinguishable cardboard people who can easily populate this kind of popcorn novel. I was wary of a plot that sounded like it involved zombies, but was relieved that the zombie-like aspect was kept to a minimal. Nonetheless I didn’t feel like that aspect needed to be present at all, seemingly just there to take a familiar SF scenario and give it a bit of a twist. Indeed the entire novel is like that: familiar, but with a bit of a zesty twist to make things feel new. A blurb in the press material compares it to Scalzi meets Firefly (Whedon). Sadly I have neither read Scalzi nor watched more than a few minutes of Firefly. (I know, I know…) But the characters and their interactions certainly felt Whedonesque to me, including the trait of being expendable. Yet, I was drawn to this looking for a good piece of science fiction, and I can’t really call it that. It’s a good adventure, set in a SF universe, but the SF is particularly soft and could leave some fans yearning for something deeper. Moreover I would classify it as what some mass paperback’s were labeled as “Men’s Adventures”. The book contains its strong female roles, no doubt, but too often they seem used for the sexual vagrancies of the more degenerate bad guys, described as if they were fantasies of the author. The ending sets up the next novel perfectly, and suggests that a bit more attention might be kept to the science fiction aspects in future volumes, which at least might be worth a light read even if nothing improves from what’s found here.